Sheena and Rohit looked adorable in their traditional attires. 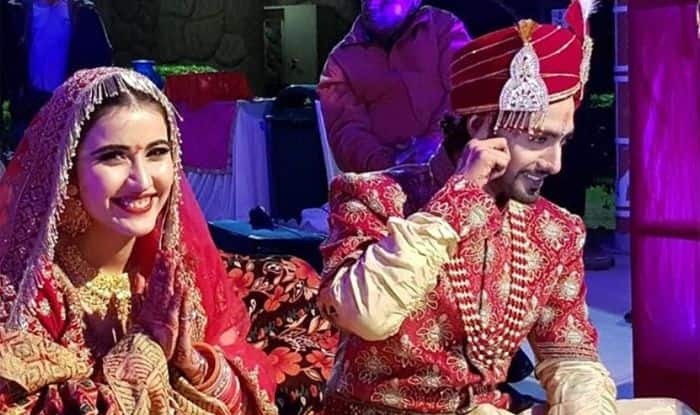 After all the pre-wedding festivities got over, television actors Rohit Purohit and Sheena Bajaj tied the knot on January 22 at a resort in Jaipur. The two, who have been in a relationship for four years after working together in 2012, looked adorable in their traditional attires. Media reports said the two got married as per Punjabi and Marwari rituals. Sheena looked every bit the Indian bride in a traditional red lehenga and blouse, with heavy gold jewellery, and Rohit looked dashing in a red and gold sherwani. From pictures and videos that have emerged from the wedding, it definitely looked like a grand affair. Sheena and Rohit, who had met on the sets of television show Arjun, had held the pre-wedding ceremonies the same day as their wedding. Sheena, who shared the pictures on her Instagram page, looked absolutely radiant in a magenta and yellow lehenga, while Rohit looked equally smart in a yellow kurta and off-white pyjamas with a Nehru jacket. Rohit, who has starred in a good number of television serials, is well known for his role as Suraj Purohit in Zee TV’s Sanskaar Laxmi. he also played the lead role in Razia Sultan as Malik Altunia, and Alexander the Great “Sikandar” in historical series Porus. Sheena, on the other hand, is well known for her portrayal of Dolly Singh in Disney Channel India sitcom Best of Luck Nikki, which is an Indian adaptation of the American show Good Luck Charlie. Apart from that she also starred in Thapki Pyar Ki, Khatmal E Ishq, and Mariam Khan – Reporting Live.